Roof Layout Part Two: Do Hobbits Brush Their Teeth for a Long Time? It was a short weekend here at Hobbit Hollow. I was only able to work about three hours on Saturday morning. Jude had a football game in Roscoe, New York which is about 100 miles away from our house. We won’t get into the whys of why we had to go so far but let’s just say that Roscoes claim to fame, if you want to call it a claim, is that it’s some sort of trout fishing mecca in the Empire state. There ain’t much to Roscoe. I mean the sign on the coffee shop door says that they are now serving breakfast from 9 to 11. Is it me or what? I guess Jeb wakes up late. It was a morale booster for the team though. They got a much needed win and there seems like maybe the fire has been lit. After the game we went to visit Ethan up at SUNY Cortland so Jude was able to take a look at the school. We had a great time.We stayed overnight at the Econolodge in Cortland. Did you ever do something before you went to bed and say to yourself: I should do something about this now because it’s going to wake me up later.This was one of those times. My wife gets cold easily so she turned on the heater. After she turned it on I said to myself “Man this heat is really crankin’ . At two o’clock in the morning I finally found out what hell is like. Hell is hot…very hot. Not only is the heat in hell unbearable but every bit of moisture that your body retains naturally is sucked out of your body so you feel as though you’ve been in Nevada’s Death Valley without a drop to drink for about ten years. I crawled to the sink with the energy I had left to get a drink of water. I hear in the background my wife’s plea:”Turn the heat down.” Then I blacked out. I’m only kidding I didn’t black out but that was the hottest room I ever woke up to. Sunday morning we got ready to drive our 200 miles back home and Terence needed to brush his teeth before we left. I mean we are waiting in the car for like 20 minutes while Terence is in there with the Crest. I know we taught these kids to brush after meals but this was ridiculous. We brought our stuff down to the car, checked out, started the car and we’re still waiting.Is there some sort of best brushed award that they give out at school that I’m not aware of? Again, maybe it’s me? Do Hobbits brush their teeth for a long time? Oh yeah, the Hobbit house. 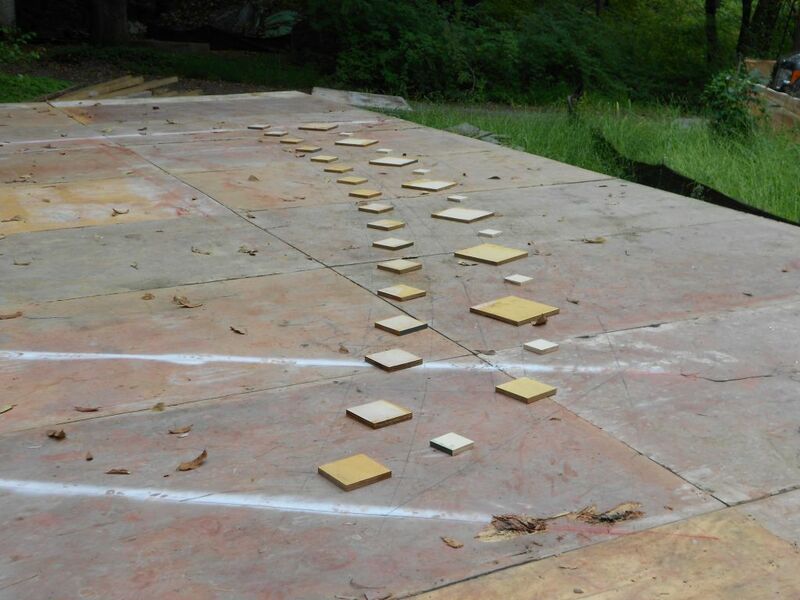 So I actually started the physical layout of the house on our layout deck. It takes time though and you really don’t want to rush this part of the process. I started with the underside of the ceiling. This is a 34 foot radius. After that I laid out the 9 slab depth at 34 foot 9 inches and the top of the retaining curb at 36 foot 9 inches. All these radi are pulled from the same center point on our 4×4 which is shown here. Center point of main layout. This isn’t such a great picture but basically I hooked the steel tape to the nail I placed at this location and used my pencil to draw these arches on the roof layout deck. You have to pull the tape pretty taut so you get a smooth curve. My arm was killing me by the time I finished. Hopefully you can see the lines in the next picture. There are some additional lines as well that I snapped. Centerline of the house,the floor,the side walls, and if you look closely above you will see two converging lines. 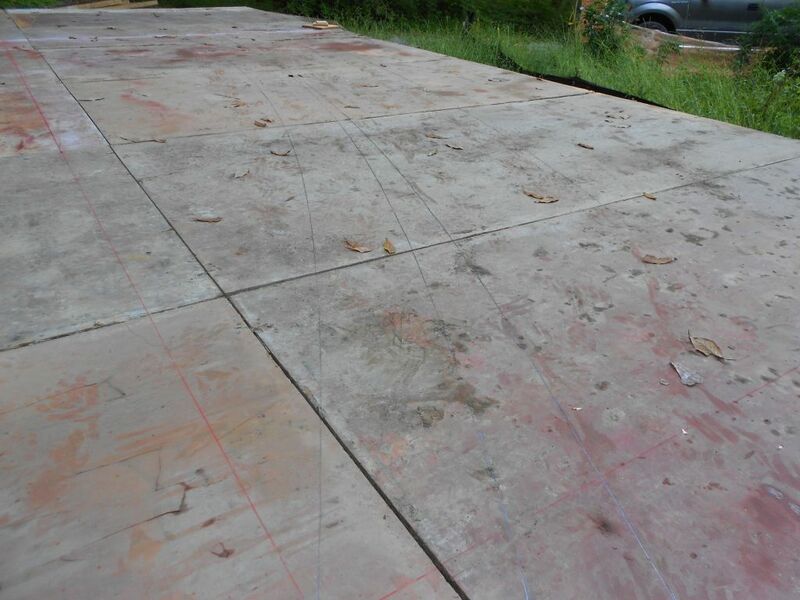 The roof slab is not a consistant thickness,it is actually what they call a tapered slab. At the side walls the slab is actually 16 inches thick tapering to 9 inches thick at the center of the Hobbit house. This is a huge structural element of this project and I am greatly indebted to Nat Tocci for coming up with this design. This element complicates a number of things and changed what I originally wanted to create visually for this house. I really liked my original drawings for this house but after Nat came up with the tapered slab detail I wasn’t to sure how everything was going to look. So one of the things I wanted to do was layout the detail work that is going to go into the front of the house. I cut up all of the blocking for the details a while back so I was able to use these blocks to layout the details and adjust them so they all fit proportionally on the spandrel face and the retaining wall curb face. Check it out. Detailed elements of spandrel and curb positioned on house. I don’t know if I lost anyone here. The detail elements have to be installed on plywood later but by laying this out now and marking everything accordingly I will be able to transfer this design onto the plywood I’m using to build the structure with. I think once you see how I put it together what I’ve done here will become clearer. One of the things I’m going to try is chamfering the wood blocking with a router. 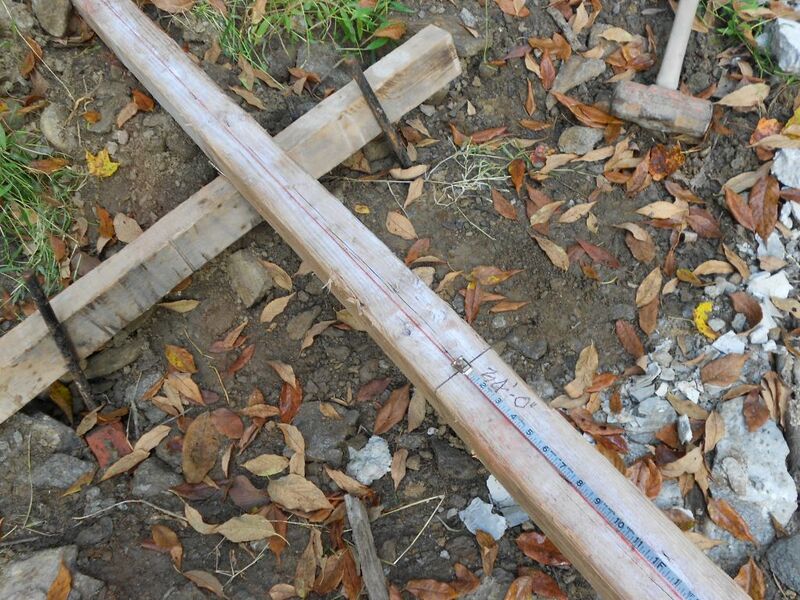 (You can’t encase square edge wood in concrete because you won”t get it out after the pour. )On the Hobbit shed I cut small pieces of 3/4 inch skew back around each individual block. This took a really long time. I’m going to get a 45 degree chamfer bit for my router and use that directly on the wood blocking.We’ll see how it goes. That was pretty much all I got done this weekend at the Hobbit house. Next weekend I’m hoping to set up for production of the roof support members.